At first glance, who cares, right? But it may surprise you how many legacy applications use Internet Explorer. For those who still have a need for IE, the arrival of a new feature in a traditional location encourages accidental clicks. Creatures of Internet Explorer habit are undoubtedly accustomed to clicking the last, rightmost tab to open a new tab. To induce users of the legacy browser to try its latest offering, Microsoft added an Open Microsoft Edge tab in that position. This feature arrived with the release of Windows 10 Creators Update (version 1607). 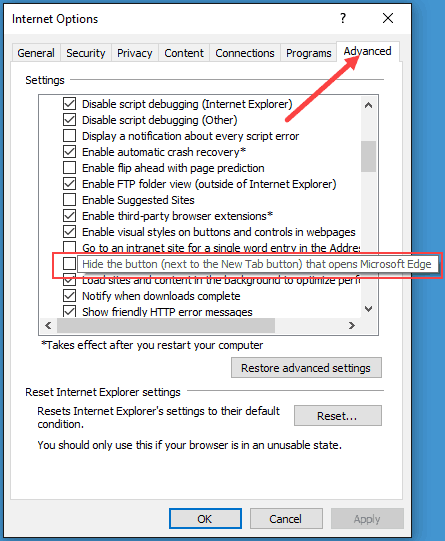 The option exists to hide the Open Microsoft Edge tab in Internet Explorer if you want to restore the previous usability. Microsoft Edge includes an Open with Internet Explorer option. So it makes sense in a way to offer a similar option in Internet Explorer. But the option in Edge allows a user to view the content they are visiting in a new Internet Explorer window. The Open Microsoft Edge option in IE only opens a new blank Edge tab instead of loading the content they were visiting in IE. The Open Microsoft Edge tab would have more purpose if it was an Open with Microsoft Edge tab. You might be someone who wanted to turn off Internet Explorer in Windows 10. If so, you may want to hide the Open Microsoft Edge tab in Internet Explorer for similar reasons. Fortunately, it does not require any complicated or cumbersome registry edits. 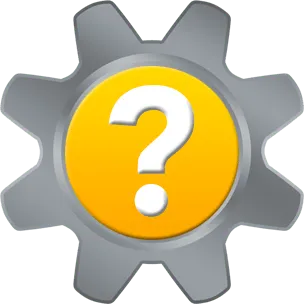 Start by clicking the Tools icon, and select Internet options. Click the Advanced tab. Scroll down to the Browsing section. Check the box for Hide the button (next to the New Tab button) that opens Microsoft Edge. 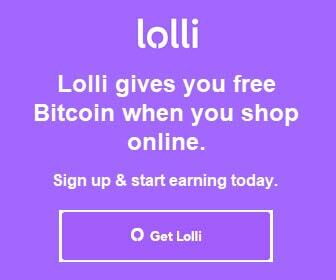 Click the OK button to save the change. Restart Internet Explorer to discover the Open Microsoft Edge tab no longer displays. Finally, you can restore the Open Microsoft Edge tab by unchecking the Hide box. 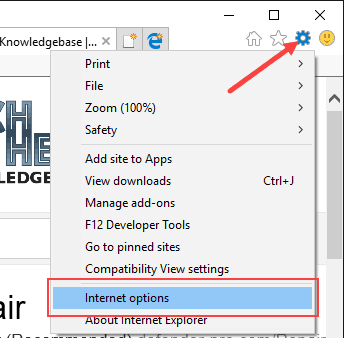 Thank you for visiting Tech Help Knowledgebase to learn how to hide the Open Microsoft Edge tab in Internet Explorer. If you liked this article, follow us on Twitter @techhelpkb and subscribe to our YouTube channel to keep in the loop.